Apple and Samsung will continue to shape the technology market this year, but can newcomers Huawei, Oppo and Xiaomi spring a surprise? 2019 will be a bumper year for tech, with established and emerging brands looking to evolve, shake up and revitalise the market like never before. Foldable smartphones, lightning-fast data connections and wearables on every wrist are just some of the things that we’re expecting, and with prices going through the roof over the last 12 months, affordability will play a key role in their chances of success. Looking at the year ahead, we’ve picked out five products, brands, trends or technologies to keep an eye on, from the key players to new kids on the block. Despite being the enduring behemoth in the tech market – Samsung isn’t averse to a safety-first approach to innovation. The last major shake-up we saw in its phone design was the ‘edge’ – curved displays that eliminated the bezel from the side of a phone entirely. 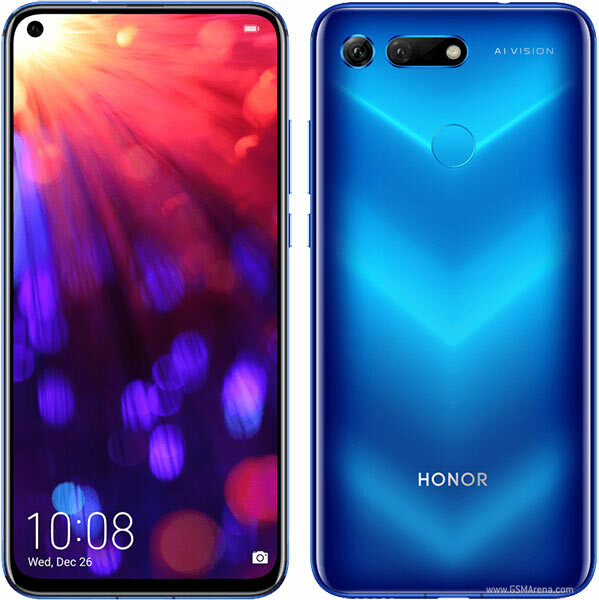 It’s been searching for its next big thing ever since, but despite the fact that the new S10 series is seen as a major upgrade (unlike the iterative nature of the Galaxy S9), it’s been beaten to the punch on two major design changes we’re likely to see – the holepunch front camera (as seen on the Honor View 20) and the in-screen fingerprint sensor. This won’t stop Samsung going all out to celebrate the 10th anniversary of its flagship mobile on 20 February, with support for 5G another headline feature to complement the aesthetics. 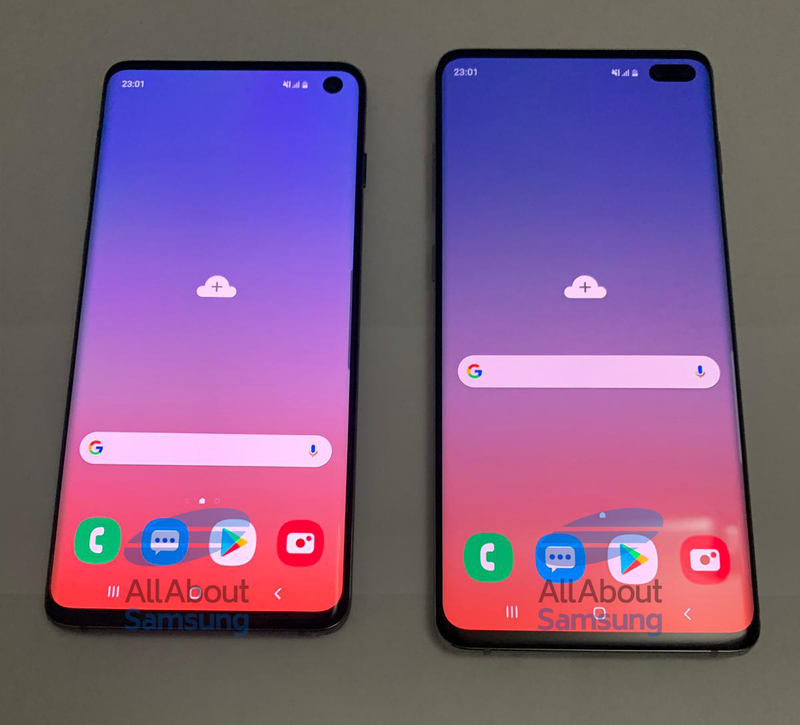 Rumours point towards three new models: the 6.1-inch Galaxy S10, 6.4-inch Galaxy S10+ and ‘lower-end’ 5.8-inch Galaxy ‘S10 Lite’ or ‘S10E’. ‘Leaked’ pictures (below) appear to confirm the S10 and S10+ will use an under-display fingerprint sensor, and thankfully, both models have a headphone jack. Ultimately the success of Samsung’s new designs will determine whether they’re here to stay, or merely another small step on the ladder to mobile phone perfection. 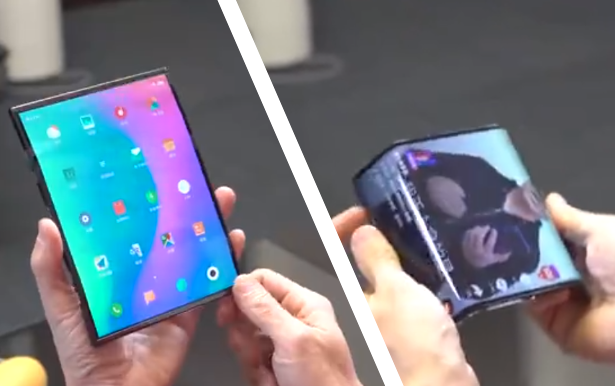 Perhaps the most exciting new arrival though, is the foldable phone. 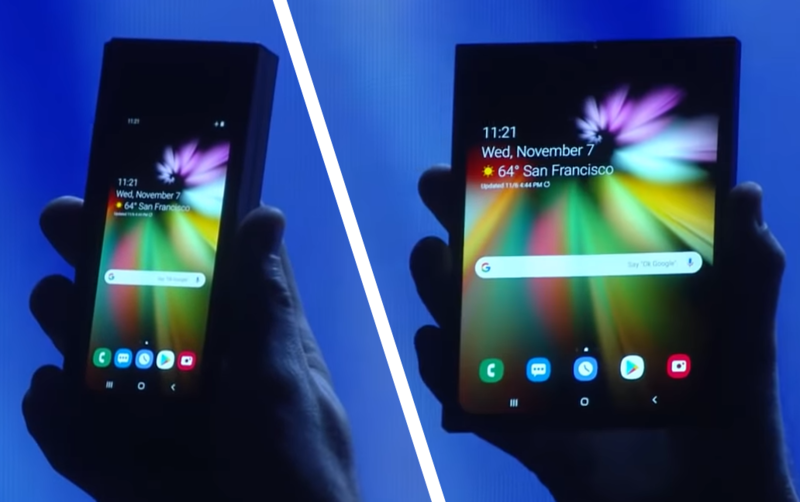 First spotted at a Samsung developer conference back in November (see below), the Samsung Galaxy X will be able to transform from a standard phone into a wider, tablet-sized device. This shapeshifting hybrid will use Samsung’s new Infinity Flex Display, and it will be demoed at the same February event as the Galaxy S10. Google has confirmed that it’s working on an Android update that will be fully compatible with foldable phones, and with brands like Huawei, Xiaomi and even Apple showing interest, we expect to see more foldable designs in 2019. See which Samsung smartphones come highly recommended with our Samsung smartphone reviews. Apple has an interesting year ahead of it, to say the least. Analysts are reporting that the group’s phone sales are lower than expected, with Citi Group suggesting Apple’s original iPhone production forecast for Q4 2018 was reduced. A Forbes report adds that last year, Apple sold 14 million fewer phones than it did three years ago. There are plenty of words out there to describe Apple’s iPhone range, but ‘cheap’ isn’t one of them. As a growing number of Android rivals launch smartphones with similar specs and cheaper prices, Apple is feeling the pinch. It needs to find a way to fight back, and fast. The rumoured iPhone SE 2 could be the device to save the day. The original SE launched in 2016 and recently went back on sale through Apple’s own website for a limited time. Since being relisted this month the phone has sold out once again, so there’s clearly a demand for an affordable small-screen iPhone. All eyes will be on Apple’s announcements this year, and in particular it’s main launch event, typically held in September. Though iPhones allegedly account for around two-thirds of Apple’s profit, it’s far from a one-trick pony. If there’s one thing Apple knows how to do well, it’s accessorise its own products. 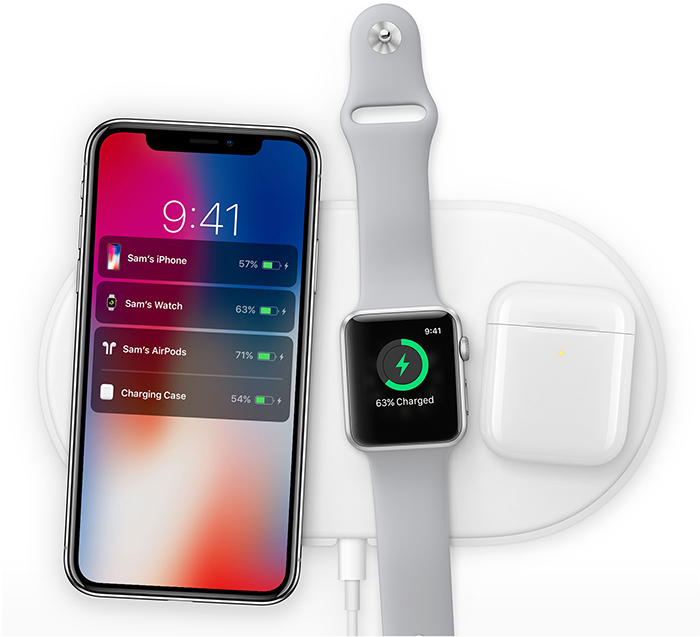 One addition that could go straight on the must-have list is the Apple AirPower wireless charger that allows you to boost up to three devices at the same time – an iPhone, AirPods case and Apple Watch, for example. We first caught a glimpse of Apple’s charging accessory back in 2017, and since then ‘manufacturing issues’ have seen the wireless charging pad delayed multiple times. But it’s now looking increasingly likely that the AirPower will go on sale this year. Reports coming from a Hong Kong tech website cite sources ‘in the [AirPower] supply chain’ saying the accessory is now in production. For Apple users, that would mean no longer having to rely on third-party chargers from the likes of Anker and Belkin. 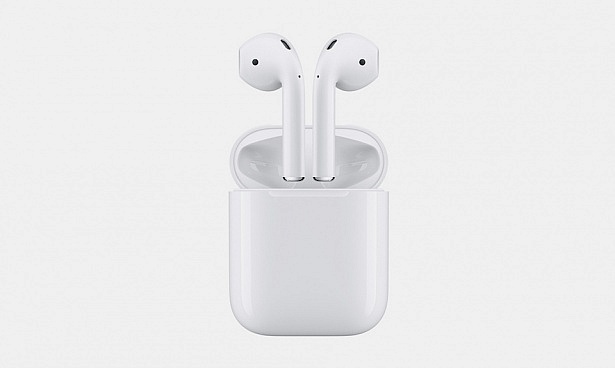 Industry insiders expect the next-generation AirPods to drop in the next couple of months. According to tech website Digitimes, the new wireless earbuds will have added health monitoring functions, which potentially means we’ll see a slight price rise. The new AirPods are also tipped to feature a waterproof design. We tested the original AirPods to see how they fared for overall sound quality, comfort and durability. Take a peek at our Apple AirPods review to see if these headphones are worthy of Best Buy status. With high-end specs and low-end prices, a number of new smartphone brands are appearing in the UK – largely from China. The success of these brands could be key to breaking the dominance of Apple and Samsung – and their apparently ever increasing prices, in 2019. Huawei has now cemented its position in the UK market as one of the go-to brands for premium mobiles on a budget. But with other Chinese smartphone brands looking to get in on the action, February’s Mobile World Congress (MWC) event could see some worthy competitors take the spotlight. Honor is already plying a good trade in the UK, recently announcing its flagship Honor View 20, and showing a clear desire to offer plenty of bang for your buck. Its phones are typically modestly priced – more so than Huawei, but it has also shown that it isn’t scared of innovation. How it evolves in 2019, will be interesting to see. You can browse all our Honor mobile phone reviews to see how they get on in our labs. Having officially landed in the UK at the end of 2018, Xiaomi will be looking to show off its existing range and its exciting work on folding phones at MWC 2019. There are already plenty of phones on offer through Xiaomi’s UK website, including the just-tested Xiaomi Mi 8, Mi 8 Pro and Mi MIX 3. We’ve looking forward to finding out more on how Xiaomi’s folding smartphone compares with the Samsung Galaxy X.
China-based smartphone group Oppo has close ties to OnePlus, with both brands sharing the same parent company – BBK Electronics. Back in July 2018, Oppo registered trademarks for 40 handsets in the UK and Europe, and now we have an official date for its UK launch – 29 January. Overseas, Oppo has made a name for itself more recently with the Oppo Find X. The trend-setting Find X is the first smartphone to use a motorised hidden panel for the front-facing camera. That nifty design choice means the display on the Find X is entirely bezel-less. We’ll be covering all the key announcements at the end of the month when Oppo shares its plans for UK consumers. 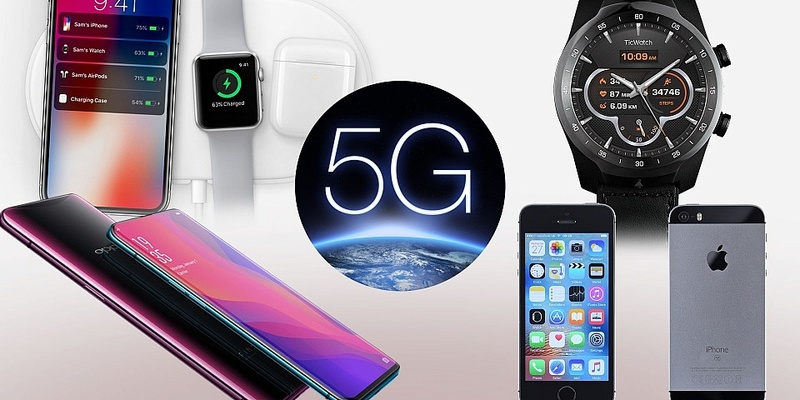 It will come as no surprise to learn that 5G connectivity will be a key theme at MWC next month. Huawei and OnePlus are already working on 5G smartphones, while Xiaomi’s Mi Mix 3 is rumoured to be getting a 5G upgrade later this year. Mobile network EE will be rolling out 5G within 16 UK cities this year, including London, Cardiff, Edinburgh, Belfast, Birmingham and Manchester. Those cities make up ‘phase one’ of its launch. EE isn’t the only network working towards a 5G future. This week, Vodafone and O2 confirmed plans to extend an existing network-sharing deal. That deal will ‘include 5G at joint radio network sites’, so the move will ultimately help both companies deploy 5G faster. Smartphone chipmaker Qualcomm has said that 5G will be significantly faster than the 4G speeds we’re used to. In fact, 5G speeds have the capability to be a lot faster than the broadband in people’s homes – the group says that under optimum conditions, 20Gbit/s is the peak data rate. Though it’s unlikely this will be achievable for many in real world conditions, some massive speed increases do seem to be on the horizon. Just how smooth the 5G rollout will be remains to be seen, however. See who we rate as the best and worst mobile providers in the UK. March is shaping up to be a big month in the world of wearables, with BaselWorld and the Wearable Technology Show both scheduled in the calendar. We’re already starting to see wearables address some of the biggest issues that have prevented them from becoming more mainstream – style and price – and we expect to see big strides in 2019. 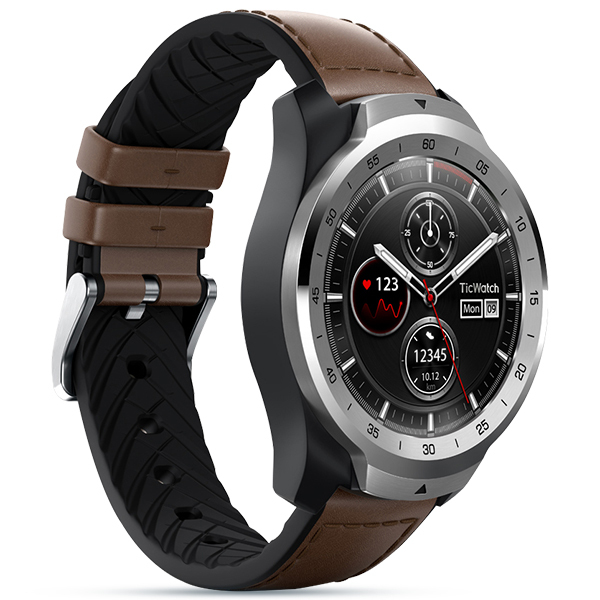 We’ve recently had our hands on the Mobvoi Ticwatch Pro, a Wear OS watch that manages to blend good looks with a practical design. The watch, which costs around £215, can read texts and emails. It has two displays – the transparent LCD display is used for battery-saving mode, but you’ll be tapping away on the OLED colour touchscreen most of the time. 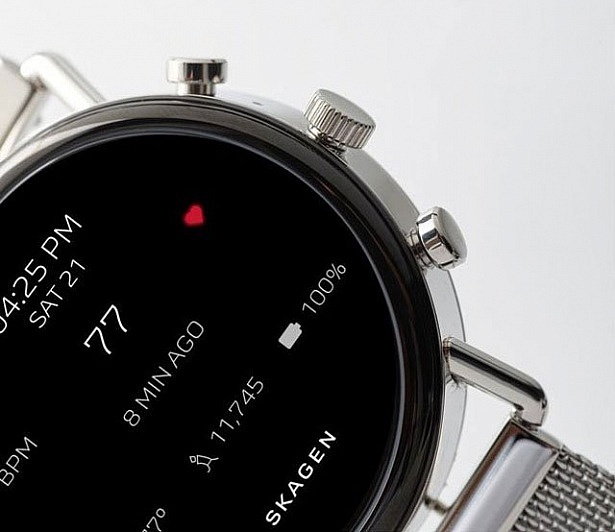 The £300 Skagen Falster 2 (above) is aimed squarely at the fashion-conscious, available with a range of different 20mm straps in leather, silicone and steel mesh. Google Assistant is built in, along with a tracker tool that helps you locate your smartphone if it’s out of sight. With so many wearables battling for a spot on your wrist, you don’t have to spend big to track your movements. 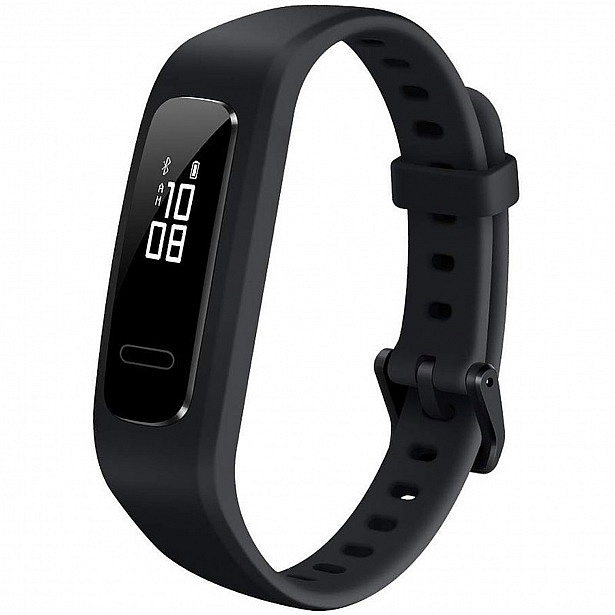 The Huawei Band 3e (£20) recently returned from our test lab, which along with the Xiaomi Mi Band 3 (£25) is one of the cheapest we’ve tested. Importantly, these wearables don’t come short of features. Accompanying step-tracking are features such as a professional running coach that measures step length, cadence and ground contact time, sleep tracking, water resistance and more. For £20, it’s difficult to argue against giving one of these a try. Find out whether to buy a fitness tracker or a smartwatch in our in-depth guide, and browse all our fitness tracker and smartwatch reviews.